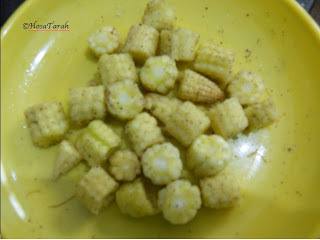 One eatable that I am never tired of, is Baby Corn & sweet corn. There are usually carts with a variety of snacks related to babycorn. The babycorn as a whole, is roasted over hot charcoal. The covering is then peeled, the babycorn cut into pieces, and given with your choice of seasoning. Hot and spicy! Now how do you make this at home? When you have an urge to eat this and there is no hot charcoal / grill microwave? For seasoning : Salt and pepper. 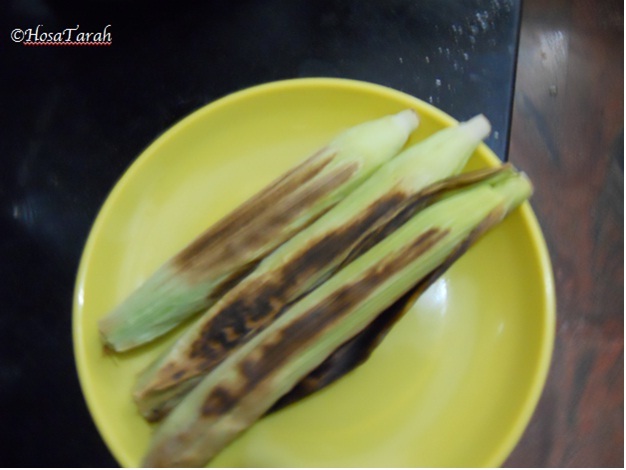 1.Heat the tawa, and put the whole babycorns. 3. This is how it should be looking. 4. Remove the outer layers, cut the babycorns into small pieces. 5. Season with your choice, Salt & pepper or Green chilli paste.